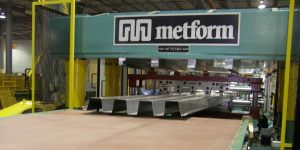 Metform is an industry leader in the design and manufacturing of roll forming deck lines. Our knowledge in steel deck has enabled us to produce 107 sets of tooling and 31 full lines in production worldwide. 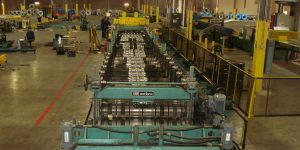 Our deck roll formers have line speeds of up to 250 fpm to produce significant volume and allow the customer to react to short delivery demands. Metform’s KwikConnect® rafted tooling system allows for faster changeovers to help customers improve inventory turns. 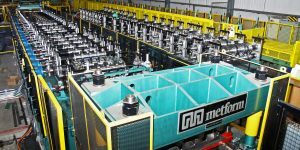 Metform’s collaborative tooling design team has helped its customers develop some of the strongest deck designs in the market with materials ranging from 14 to 22 gauge and utilizing the highest yield strengths available in the market. Other features include unique emboss patterns, slot vent tab and hangar tabs. 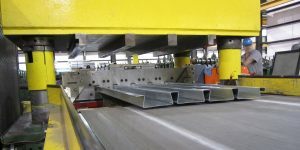 Metform also has an industry unique “side roll unit” allowing quick change within minutes from “nestable” to “interlock” styles of deck. Superior dimensional quality including cover width, flatness, straightness, no oil canning and consistent emboss height ensures that the contractor in the field can erect efficiently. 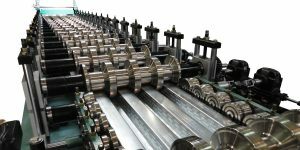 Metform’s roll forming lines are proven robust to survive the demanding production environment of steel product producers. That means more reliability, more uptime and better profits.